International charitable organization “Environment-People-Law” reviewed the draft law №4493 “On Electricity Market of Ukraine” and amendments # 1104, 1106, 1108 to it that propose classification of domestic waste as a source of alternative energy and setting “green tariff” for enterprises that produce energy from domestic waste. The draft law in its original wording did not contain any provisions for providing green tariff to entities that produce electricity from domestic waste, which essentially does not comply with the national and European legislation. 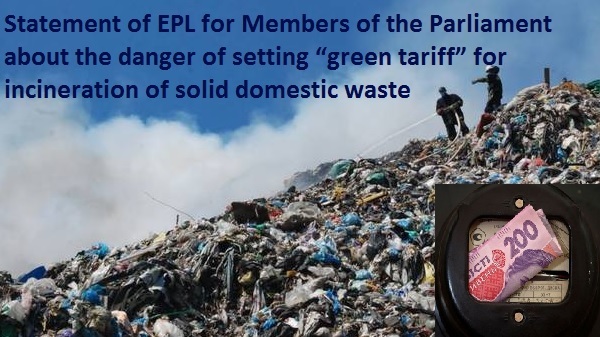 The proposed rate of the green tariff is not justified, there have been provided no calculations regarding the rate of the green tariff, financial return of the equipment for producing energy from domestic waste and for waste treatment facilities for emissions into the air, increase of the final price of electricity for consumers. The draft law does not specify the mode of production of electricity from domestic waste. According to the national legislation, the green tariff already applies to the production of electricity from biogas generated during microbiological decomposition of organic components of municipal solid waste. In Ukraine, there are no enterprises for environmentally safe incineration of solid domestic waste. Domestic cement companies that can provide high-temperature incineration of municipal solid waste do not have the necessary purification filters for trapping pollutants. For environmentally sound solid waste incineration, it is necessary to ensure high temperatures – more than 1200 ºС. In Ukraine, high temperatures are used in manufacturing processes for production of cement. For incineration of solid domestic waste in cement factories, first of all it is important to ensure waste segregation. Only sorted and crushed waste can go to cement plants. In Ukraine, there are three cement plants that use environmentally friendly “dry” method of cement production: in Ivano-Frankivsk, Kamianets-Podilskyi and Kryvyi Rih. Kamianets-Podilsk cement plant spent more than 300 mln Euro to transfer the production to dry cement production, which minimizes the emission of pollutants into the environment thanks to the new modern system of dust control by bag filters. For example, the incineration plant in Poznan (Poland) installed cleaning equipment of a Japanese firm that costs 140 mln. Euro. Cement plants must have additional filters to capture emissions of pollutants. Permanent environmental monitoring and control of emissions of pollutants into the atmosphere should be performed. The adoption of the draft law is contrary to Directive 2010/75/EC of the European Parliament and of the Council of 24 November 2010 on industrial emissions (integrated pollution prevention and control), the introduction of which in Ukraine is envisaged by the EU-Ukraine Association Agreement by 1 November 2016. The Directive provides for ensuring a high level of environmental protection, public health and established a list of pollutants for mandatory pollution control at incineration plants. In particular, the Directive provides for at least two measurements of heavy metals, dioxins and furans per year. During the first 12 months of operation one measurement every 3 months should be carried out. The control over emissions of complex organic substances (dioxins, furans, polyaromatic hydrocarbons) at the state level is not exercised. Today, when the state cannot ensure sufficient investments for the construction of the necessary purification facilities of incineration plants, does not provide for waste segregation, its preliminary treatment, there is no sanitary and environmental control of complex organic pollutants in emissions in the air, there is no approved national strategy of waste management and private business will not invest substantial funds into purification facilities and will try to save while gaining profit from green tariff, we consider unacceptable adoption of the draft law №4493 «On Electricity Market of Ukraine” with amendments # 1104, 1106, 1108, which constitute a threat to the environment and human health.